Hi, my name’s Chris and I am a Pokémon addict. If you’ve been out in any major city over the past week or so you will no doubt have noticed gangs of 20-30 year olds huddled round monuments, churches and landmarks, madly swiping at smartphones. No, gang culture isn’t on the rise (not to this extent anyway). It’s the return of a 20-year-old craze, which didn’t really go away properly. Pokémon is back and it’s taking over lives in the form of a new smarphone app from Nintendo and Niantic Labs. Pokémon Go is a “real world adventure” which uses GPS and augmented reality to allow users to track down, catch and train their favourite little monsters in a bid to become the best trainer in the land. Although only available in a handful of countries at the moment, fans of the franchise have been using all means possible to obtain a copy of the game. I am one of those fans. The game, whilst not being too dissimilar from Niantic’s 2013 game Ingress, is getting mixed reviews from critics. Whilst fans are living and breathing the game, searching large bodies of water for that rare Dragonair or deep forests for a Snorlax, some non-users say that gamers are just substituting their computer screens for a smartphone. On this I have to disagree. Pokémon Go is a social game – it thrives on interaction. For example, outside of the office where I work is a Pokestop. Yesterday there was a group of six people outside, swiping away as they tried to claim the hidden items inside. After talking to them I found out these people didn’t know each other and in fact Pokémon had brought them together. 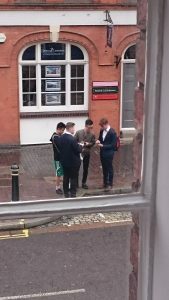 Six complete strangers were now friends as they discussed tactics and where they found their rare Pokémon. Is this really a bad thing? Pokémon isn’t just good for social interaction though, it’s helping people discover and explore locations they may not normally have visited. 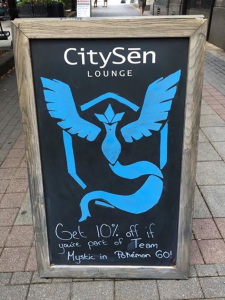 Businesses are also trying to get in on the action. 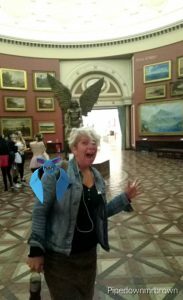 I popped to Birmingham Museum & Art Gallery with Pokemon-newbie Mar Dixon the other day as I attempted to explain the concept of the game. We wandered around the museum catching all sorts of Pokémon amongst the Staffordshire Hoard and Pre-Raphaelite collection. One member of staff stopped to ask us if we were playing Pokémon – we of course answered sheepishly but were reassured when she told us they had had lots of people in doing the same thing. Again, surely this is a good thing? The game is actually getting people inside cultural venues and its not costing them a thing. 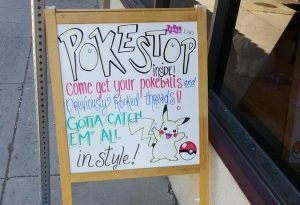 At this early stage venues can’t actively do anything to encourage Pokémon inside their space (unless a player users a special item called a lure) as they appear at random; however the developers are working on ways to form partnerships and monetise the release of some of the more rare Pokémon through special events. There’s nothing stopping organisations just inviting people inside to explore though, in fact some are already doing it. Considering the game still hasn’t officially launched across most of the globe, it has already been installed on more Android devices in the US than Tinder. On 10 July Forbes reported the number of daily active users on Android would soon surpass Twitter. Since writing this, that may have already happened. Will the trend last though? With a few big updates on the horizon, which include the ability to trade with friends, Pokémon Go could be here for a while. It will certainly be interesting to see how cultural institutes make use of it though. See Chris Brown on Twitter.